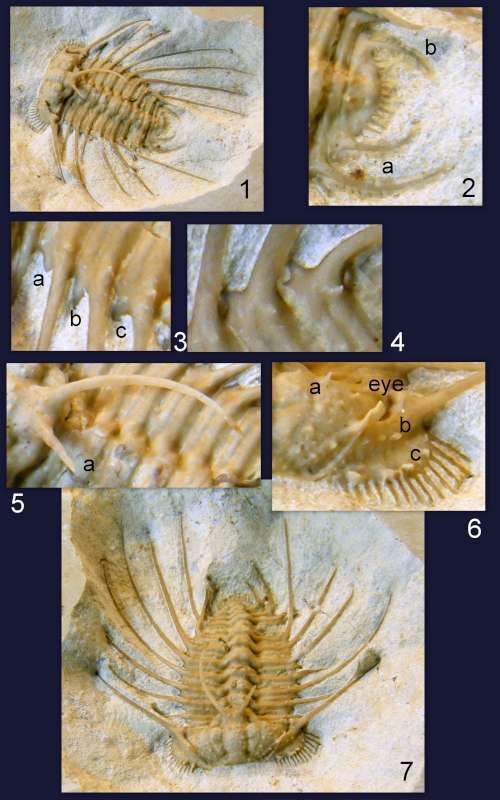 In the collage below are shown several views of a potentially new species of Ceratonurus excavated from the Bois d'Arc in 2009. I think it will be placed in the Back to the Past Museum in Cancun. This unusual specimen is the first from the genus to be found so high in the Devonian rock column at Black Cat Mountain. All previous specimens were found in Haragan rocks. Photo numbers 1 and 7 show overall views of the dorsal and anterior aspects. Photo number 2 shows the pygidium; 3 and 4 show close views of the thoracic margin near anterior and posterior positions; and photo 6 shows details of the genal structure. Like its Haragan relative, this species has similar broadly sweeping lateral thoracic spines, but these appear to be laid out more smoothly with respect to each other, rather than undulating as is typical of Ceratonurus. Also, like its earlier relative, a series of thoracic spines remain encrypted in the matrix between each of the prominent thoracic spines. Three of these, labeled "a, b and c" are exemplified in photo number 3. 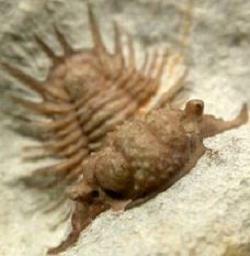 These remain covered in most specimens because they are too difficult to excavate without damaging neighboring spines. These cryptic spines turn ventrally into the matrix, and details of their structure have not been described. A second distinction with the Haragan species can be seen in the more robust structure of the ridge, which follows the facial suture. One view of this ridge can be seen in photo 6, where the ridge passes behind the eye and merges with the genal spine. One of the two occipital spines (photo number 5, indicated by "a") was truncated by un-identified natural causes, representing an unusual pathological deformity or predatory scarring. In photo number 2, I attempt to highlight the diminutive, almost microscopic, lateral spines which adorn the principal pygidial spines. These are indicated by "a" and "b" in this photo. At least three rows of tubercles and spines adorn the free and fixed cheeks shown in photo number 6. The more prominent of these are indicated by "a, b and c." Many of these and other spines on the fossil have been severely truncated by the air abrasive used to remove carbonate matrix from the cuticle surface. Only part of their original height remains, and they originally terminated in an almost microscopic, transparent tip. Based on observations from Bob Carroll, many of the tubercles on the surfaces of these odontopleurids should actually be counted as spines, and would be so had their tips not been removed by weathering or artificial process such as excavation.